Drawing inspiration from the world and women around her, Ewa paints with intense, saturated colours to illustrate a vibrant and magical realm. 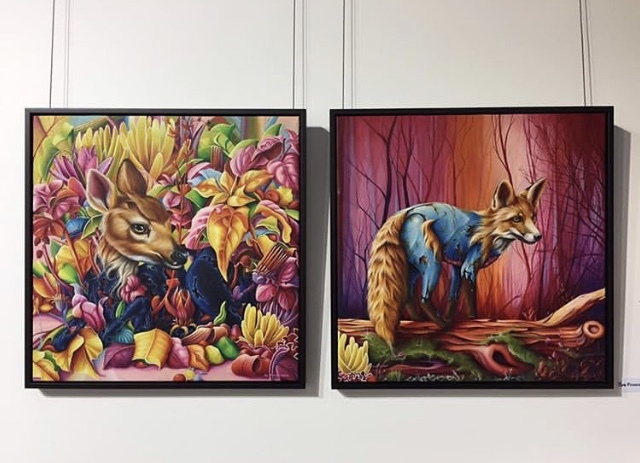 The beautiful female protagonists of her canvases are often shrouded in mystery, sometimes masked or with overgrown rabbit ears, whilst her surreal depictions of animals appear to be woven from the stuff of dreams, giving us a glimpse into the inner world of the artist. Polish artist Ewa Pronczuk-Kuziak lives and works in Warsaw. In my paintings I focus mainly on women and their feelings. My paintings are a kind of studies of women’s psychics, their emotions and relations with the environment. I create oil paintings on canvas with magical colorful world, which is not always the reality of children’s dreams. The newest “Still Life” series has been created, as previous ones, based on contrast and dissonance, intense and rich colors; however, this time focusing on animals. They have been interpreted in surreal forms and suspended between the reality and dreaming, between life and death. Within all the structures, matter, and contrast I simply ask a question: who are they for us – friends or trophies?